Photographers, like any other artist, need to have a good place to put their portfolio. There are galleries out there of course, but not all photographers enter the gallery route. As such, there should be a place to put all the good photos a photographer has taken as a point of reference for future clients. Fortunately, the world is already highly digitized. Most of the people globally have taken it to the internet to gain and also share information. Since almost everyone has smartphones and tablets now, more and more people are hooked online not just in one specific country but globally. This could definitely be an advantage for photographers since they can reach not only the clients they want, but also potential clients from different parts of the world. All they need to do is to make their work digital as well and put up a digital portfolio by setting up a website of their own. This way, potential clients can focus on the photographer’s works instead of sifting through the photographer’s social media account. One important consideration that the photographer needs to factor in is that his or her website should use a Photography theme. Why it’s important to use a photography WordPress theme? WordPress is arguable one of the best blogging platforms out there due to its various features, both for professionals and for those who just want to have a site of their own. This platform allows users to apply themes on their website to make it their own, and as photographers, it is important to choose the type of theme that is perfect for photography. First of all, photography WordPress themes are designed specifically for the photographer’s craft in mind. The quality of the photos is ensured to be hi-res and exactly what the photographer took. Next, photography themes may allow photographers to create their own online galleries the way they want it. Lastly, photography themes carry the brand of the photographer, impressing on to the visitor their art style. Focussity is a WordPress Theme that is specific to a certain niche in the photography industry: Wedding Photography. Its layout really feels warm and romantic, which is perfect for wedding photographers who want their visitors to automatically feel that the user is a photographer who knows weddings at heart. Focussity prides itself for having a very convenient and easy drag-and-drop builder, allowing users to design their very own website without having to touch the codes. There are also multiple layouts to choose from when customizing the theme, and the gallery is simple, clean, and elegant. It is also SEO friendly for those who want to boost the site’s traffic and have more potential clients. The design follows the guidelines made by Google itself. Focussity ensures that it has everything a wedding photographer needs: a good gallery to showcase heartwarming moments from weddings that they captured, SEO-optimized features to get more clients, and a beautiful design to show how perfect their photos are for weddings. 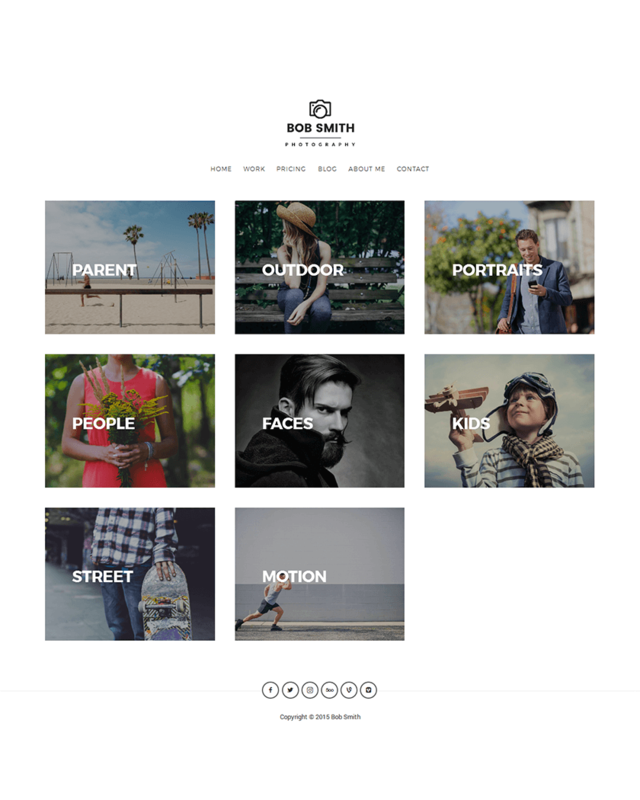 RokoPhoto is one of the best Photography WordPress themes for professional photographers. Its design is really impressive, making visitors think that the user is really one notable photographer. As it is for photographers who have an impressive photography background, RokoPhoto makes sure that they can sell artworks and photos through the site as well, making it not just a portfolio but a money-making platform as well. RokoPhoto does this by being compatible with WooCommerce. RokoPhoto has a responsive design, making it accessible for mobile devices while maintaining its impressive design. Users can also customize with RokoPhoto through its easy-to-use drag-and-drop content builder. This makes it easy for the user to arrange widgets and layouts around the site. It is surprising that this neatly designed theme is actually lightweight, making the website easy to load for visitors who don’t have a lot of time in their hands. Other additional features include being SEO-ready and optimized, translation-ready, and mega menus. The Photolux theme comes in three base skin choices that the user can choose from: Dark, Light, and Transparent. But customization doesn’t stop here. It still allows the user to have a good time modifying the theme’s skin. Adding to the customization capacity, the theme is backed by the advanced Pexeto Panel, which is a tool that allows the user to manage the theme however they want it. It is supposed to make the modification easier, even for those who have no coding experience. The theme is a good portfolio for photographers because it has an AJAX gallery with animations and effects for an interactive experience for visitors. The gallery accepts various image sizes as well. In addition, the user can put up as many galleries up there as Photolux allows for an unlimited number of galleries to showcase the artist’s work so the artist wouldn’t have to worry about building another site. Editorial photographers will find the Skylab WordPress theme very useful especially if they need to put up a portfolio online. It has a trendy yet classic design that will showcase photography, particularly for fashion. But this isn’t just really limited to editorial photographers. Skylab’s flexible design can also be used by graphic designers, artists, creative directors, and even architects. Aside from its unique and trendy design, it is also responsive and retina-ready. There are various layouts to choose from so users are not limited to one layout design that can be used by other users. For a more creative touch, users can also customize the site’s typography. Users can also add their own logo, change the color and style, and many other tweaks without disrupting the entire code. Skylab is also translation-ready so anyone can use this design. It also allows premium plugins such as Visual Composer, Slider Revolution, etc. Photographers will definitely have a variety of photos, changing in size, color, and other aspects. The Border theme is prepared for that. Whatever the photographer shoots and uploads on the website, Border sees to it that it is published in the optimum way. What’s unique about Border is its animated page transitions that are guaranteed smooth. 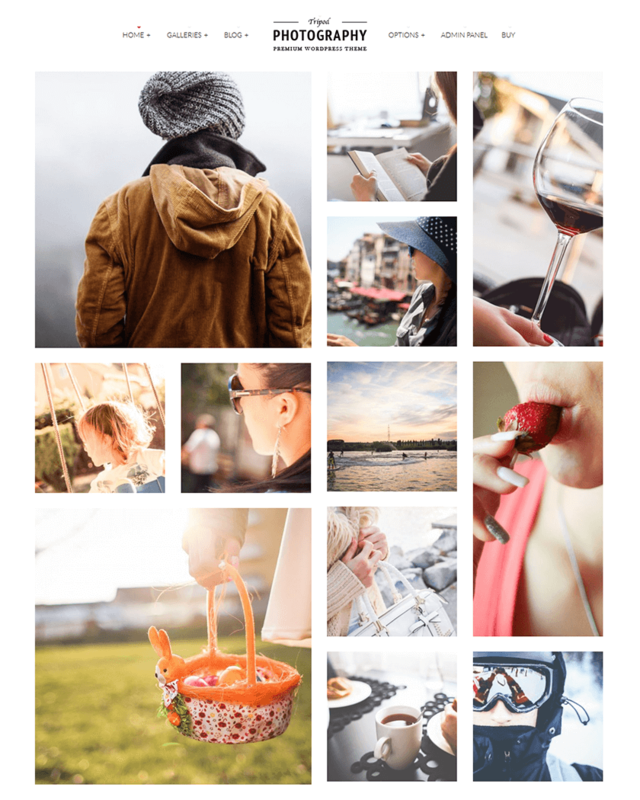 Photographers may choose among several layouts for their galleries: slideshow gallery, masonry, or grid. Another unique feature of Border is the Gallery Cover Text which can also be animated. This can be customized by the user by choosing fonts from the hundreds of Google Fonts available as well as types of styles and colors. Border also supports videos so if the photographer also has an eye for moving images, then Border makes sure it can cover that. This theme also allows for a comprehensive social media integration because it understands that a photographer’s work does not need to be confined in a website. 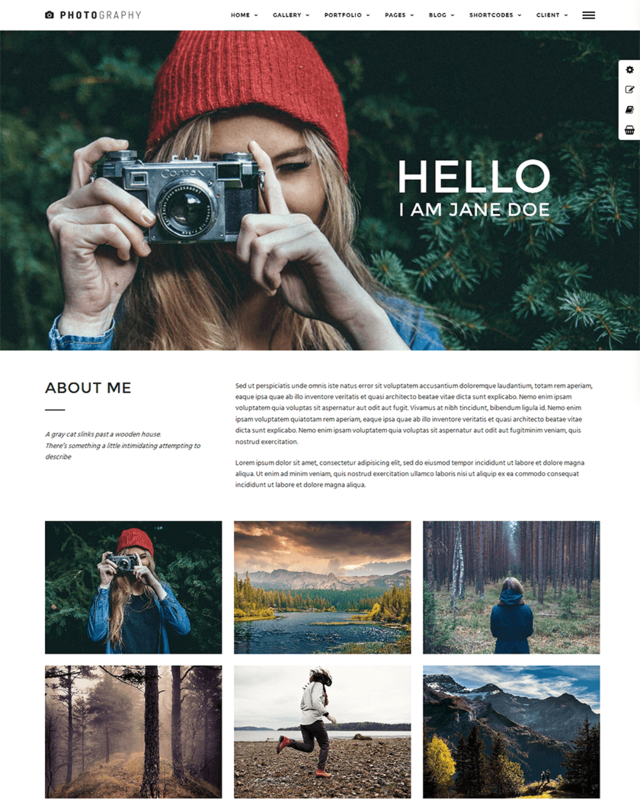 Another photography WordPress theme powered by Advanced Pexeto Panel that makes the site easily customizable for creatives and artists who want to express themselves through the website is Expression Photography WordPress Theme. It’s also good for those who have a ton of photos at their disposal. It has a dynamic AJAX gallery that has unlimited pages for unlimited sets of photos. The slider gallery can also be used not just for images, but also for videos. In addition, images can have custom sizes in the gallery, so the user does not have to spend a lot of time editing photos. It is also responsive to any mobile device so your website is free to access anywhere. The slider gallery is designed to be responsive even on mobile devices, too, so the unique experience translates to devices. What sets Expression Photography apart is the integration with Adobe Lightroom which allows you to export photos from Lightroom to WordPress instantly. 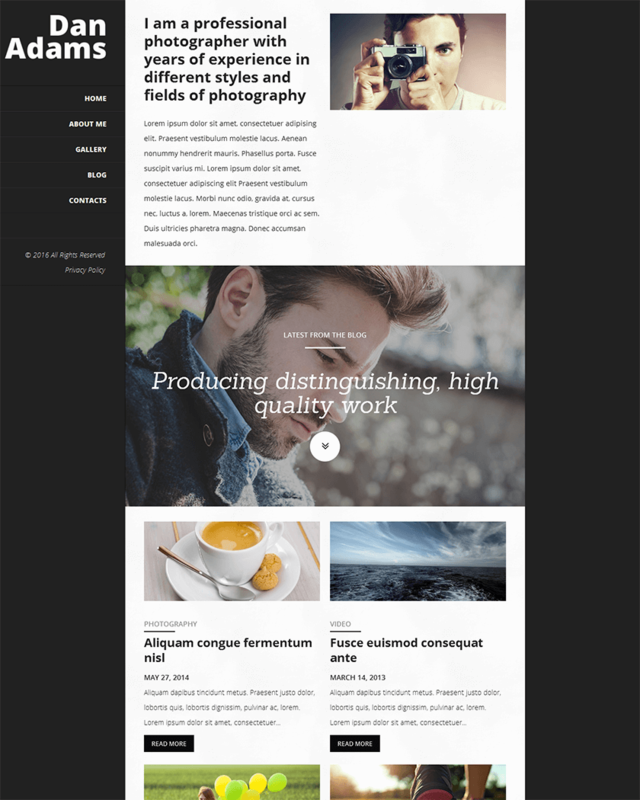 Photographer is the type of WordPress theme that promises a distraction-free design. It allows visitors to focus on the photos and accompanying text of the photos. Most photographer WordPress themes allow for an optimal view of photos, but Photographer allows the photos to be zoomed in any device, making it responsive to any mobile device as well. It also allows for multiple portfolios and galleries in the site, and the design itself can adjust to the images and videos being uploaded. However, Photographer only allows the user to choose from two design layouts, compared to some of the themes that allow several layouts. It has, however, a theme customizer support for customization, using over 600 Google Fonts, custom widgets, unlimited sidebars, and many others. The Photographer theme is good for professional photographers and bloggers who love mixing their entries with photographs they’ve taken for a visual treat for website visitors. 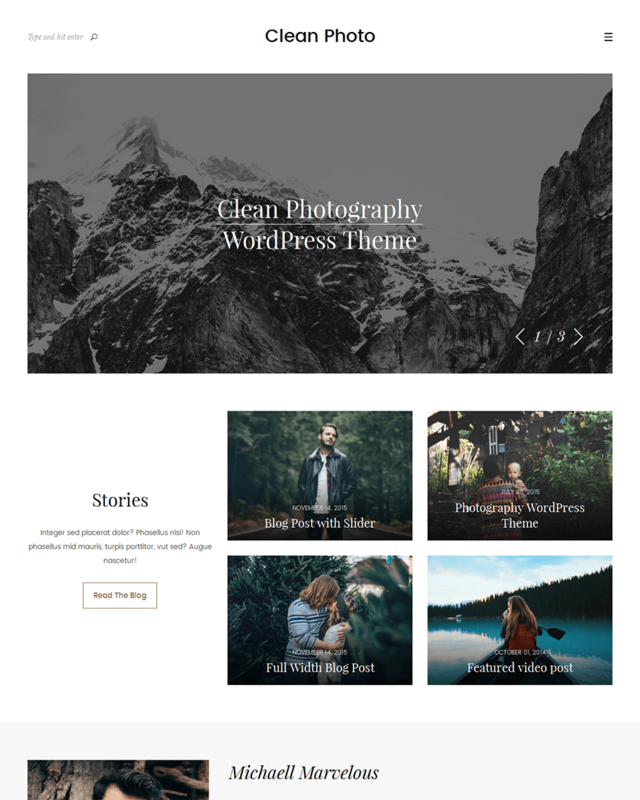 Photography is a very modern and clean Photography WordPress theme that allows the site to showcase a plethora of photos. Its clean design is very simple, too. It has a header where categories can be placed, the title at the top, a brief description below the title, more page links, and then the photos. For its services, Photography has a live content builder that is also as sleek as its design, mimicking the interface of the Keynote app. As such, it makes it a whole lot easier to use, perhaps compared to other content builders. The content builder also allows the user to visually manage the content, compared to doing it traditionally where only codes and letters are seen. It’s also pretty responsive, but the highlight of this site, aside from just showcasing portfolios is that visitors can buy directly from the website itself, as it is integrated with WooCommerce. Photo Nexus is as artistic as it can get while maintaining a minimalistic vibe. It has two variations that users can choose from: Bright and Dark themes. The features of theme include photo gallery slideshows, blog sidebar, page templates, user control settings, use of Google Fonts, image resizing, and many others. The photo gallery is a feat in itself. It can support either landscape or portrait-oriented photos, pause and resume for the auto slideshow in case visitors want to look at a photo a lot longer, easy sorting of gallery images, direct-linking photos with commenting, and many more. It is compatible with all major browsers as well as XHTML and CSS. Photo Nexus is not just limited to photographs either. Other types of artworks can definitely be showcased through the Photo Nexus theme considering that any size and orientation can be uploaded in the photo galleries. The theme is also easy to use and managed. The KingSize WordPress theme definitely deserves its name. 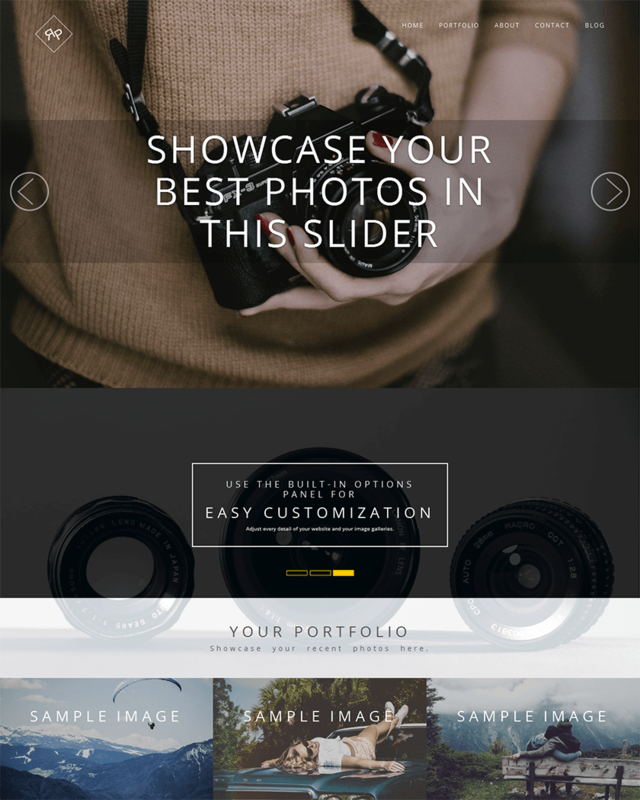 It’s a full screen photography WordPress theme that is fully responsive in all mobile devices as well. It’s very useful for those who want to customize their websites. It allows users to choose from unlimited colors and skins, a popular feature from their newest update. It also allows unlimited full screen backgrounds. There are also seven galleries to choose from, ensuring that each gallery published can stand out on its own. On top of this, KingSize allows for an unlimited number of portfolios. There are also custom widgets available for this particular theme. In addition, it is WooCommerce-ready so photographers can easily sell directly through their website. Making adjustments shouldn’t be a problem either through the theme’s Visual Composer and advanced user-friendly theme options. Some bonuses include language localization and compatibility with major browsers such as Chrome, Firefox, Safari, Opera, and even Internet Explorer. 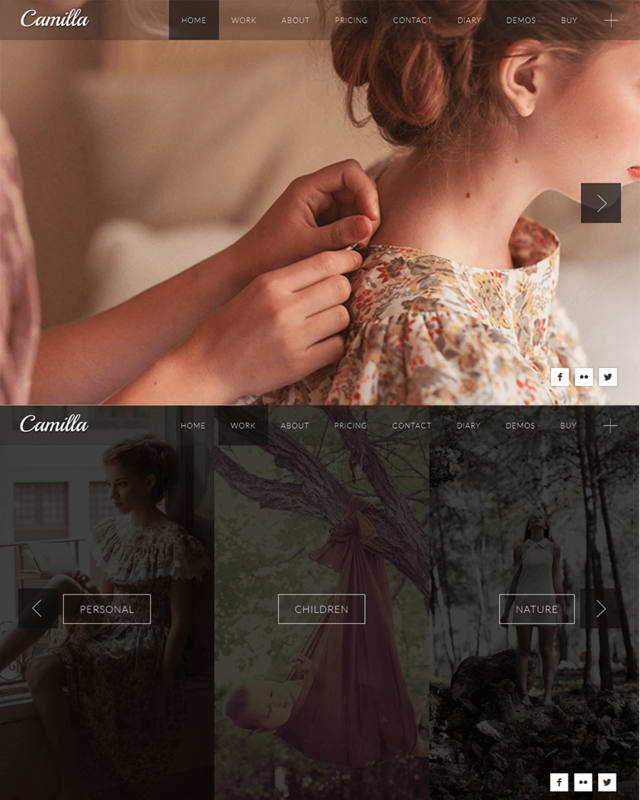 Camilla is a very elegant Photography WordPress theme. It has a clean and simple interface with a horizontal canvas. The theme makes sure that the highlight of your website is your work and it does so perfectly. The Background images are full-width, which is perfect for visual visitors. Widgets are limited to a header, since the horizontal canvas will take much of the middle space. This can be customized by uploading a background image or simply filling the space in with a color. 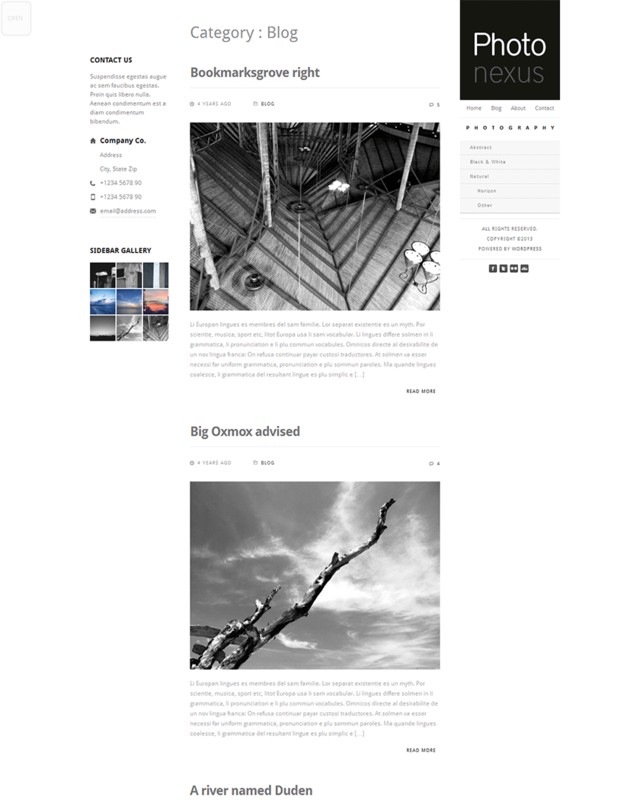 Photography Online WordPress theme is a sleek and modern theme fit for modern photographers. It has a 100% responsive design that is compatible with any mobile device, be it smartphones or tablets. It is also fully editable, making it easy for users to change the typography, the size of texts, the positions of the sidebars, and the types of sliders that can be seen in the site. It also allows users to have freedom with the format of its posts, whether the user wants to publish the format in standard form, gallery, link, a stand-alone image, a quote, an audio file, or a video file. Photography Online is translation-ready as it is WPML compatible. Rest assured, the site can be visited by anyone in the world and they will understand it even if the user only speaks one language. Other features include a backup feature, various sliders, a built-in theme customizer, and an SEO-ready feature. When it comes to just highlighting one’s photos, Invictus seems to be an expert there. This modern theme has only one objective in mind, which is to showcase one’s photos as clear as possible. Invictus highlights photos by allowing a full screen view of images and videos by default as well as through a Flickr slideshow. If the photographer has a lot of galleries and photos up there, Invictus accommodates this by employing a mega menu. It’s retina-ready for a good view of the artist’s photographs, and it is also responsive in any device. Other features include Google fonts of over 500, translation ready for a wider reach in the market, 18 custom templates for customization, and a sidebar manager. If a photographer is not really one to speak too many words and would like to just show his or her skills through photographs, then Invictus theme might just be for them. 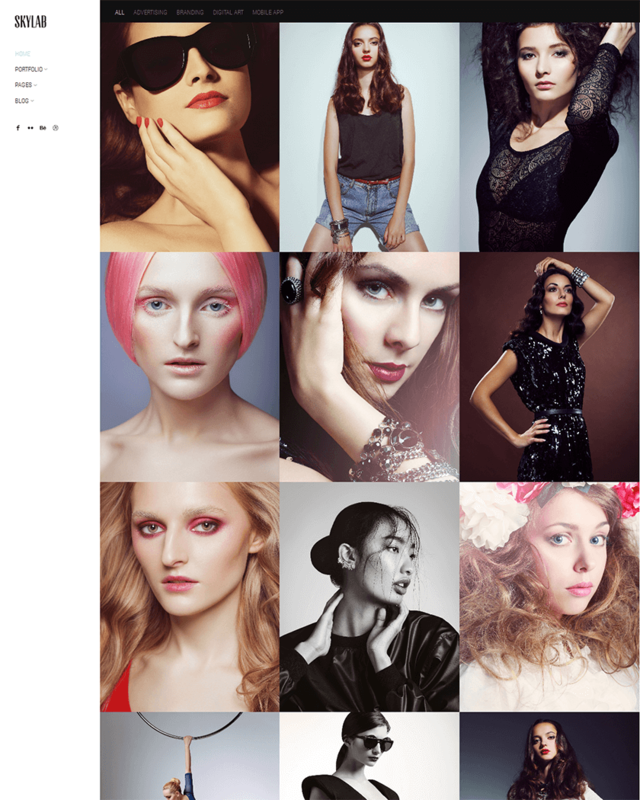 Photography Portfolio is also a simple and straight-forward photographer WordPress theme. It, however, uses more color than most of the themes on this list. The site’s title is at the very top header with a search bar beside it for easy navigation. Right below this are the categories. The theme uses a two-column layout comprising of blog entries and widgets on the side which can be used for the bio and additional categories. The background can be a design that the user may change any time. Even though it is very simple, it is highly functional, bearing standard features such as being fully customizable, allowing custom post types, and being responsive, and multilingual ready. 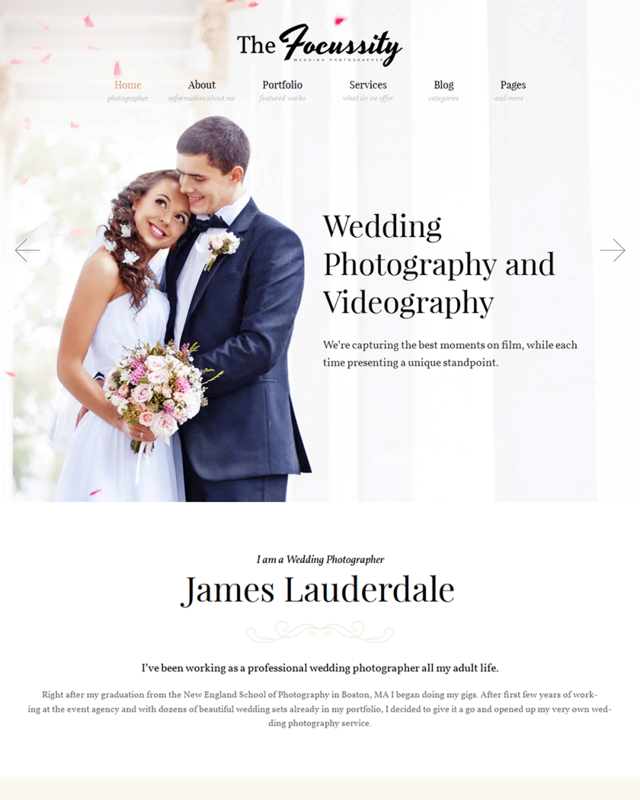 Photographer Portfolio is really a no-fuss, distraction-free, and highly-functional WordPress theme, as long as the user knows exactly how to design it properly. In addition, it is very easy to customize so the user won’t have a hard time making adjustments to the theme. 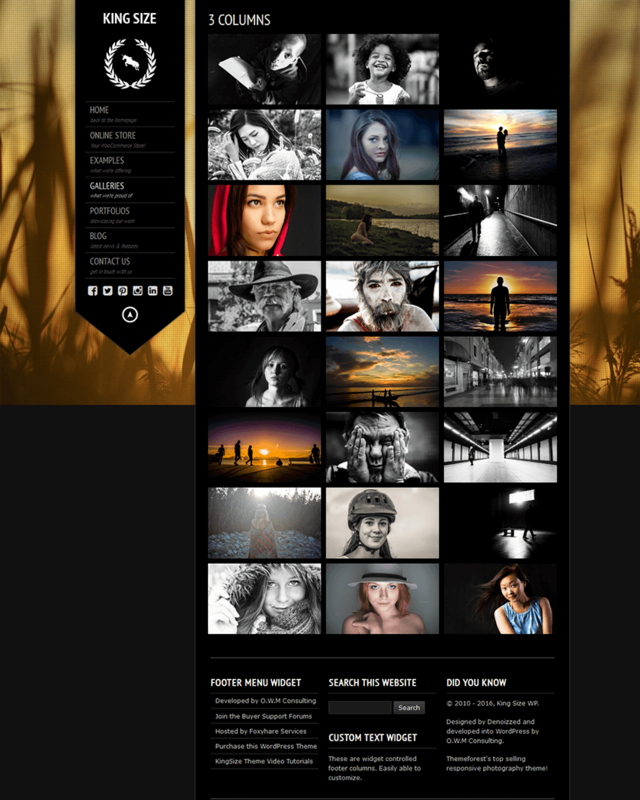 FotoGraphy is a very elegant photography WordPress theme that photographers can use to showcase their photos. It’s highly customizable as well, with four gallery layouts to choose from, two blog layouts that the user may use, and three single gallery page layout options. In addition, it also has a built-in customizer that makes it easy for the user to make adjustments to the site. This way, users don’t have to go to the code itself and make the necessary adjustments for them to fully “own” the site in terms of design. This photography WordPress theme also has other necessary features for users such as a portfolio section, which is useful for photographers who have many portfolios; Instagram showcase for a good social media integration; a slider that is smoothly designed; and a service section. Fotography is definitely a good option for photography WordPress template themes for both budding and professional photographers alike. Aside from some of the standard features that many themes already have, such as being 100% responsive, being fully customizable, multilingual-ready, SEO-ready, the design of Fancy is actually its most unique selling point. 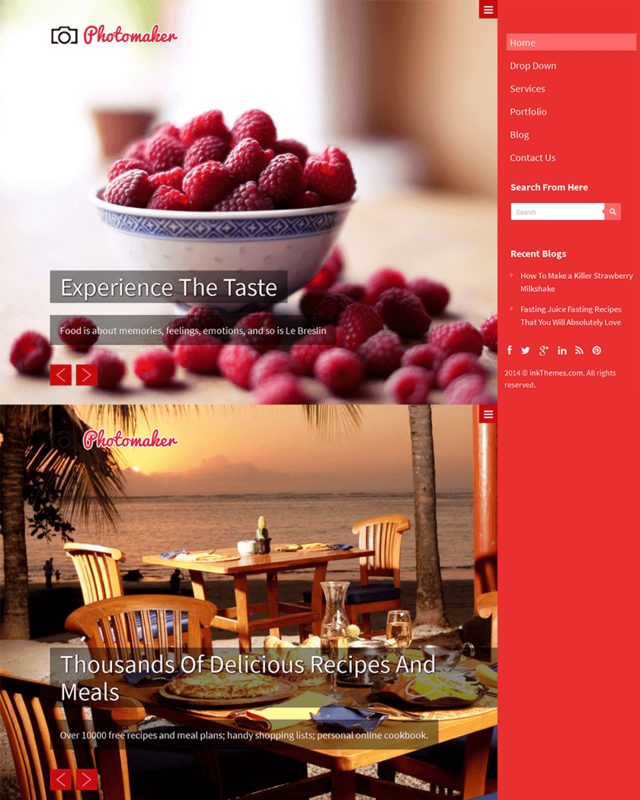 The theme uses a two-column layout and it features a full-width background where the user can upload their own photo. The header contains the title of the site as well as the categories. On the background image, page links are placed, together with social media links. Aside from images, the theme is also designed to play audio files and video files smoothly so aside from photographs, videos can be uploaded such as short films and teasers. This allows for a more creative use of the website. Fancy is a pretty straight-forward WordPress theme that is perfect for professional transactions, but of course, it can also be used for personal blogging. It is highly functional and easy to use. 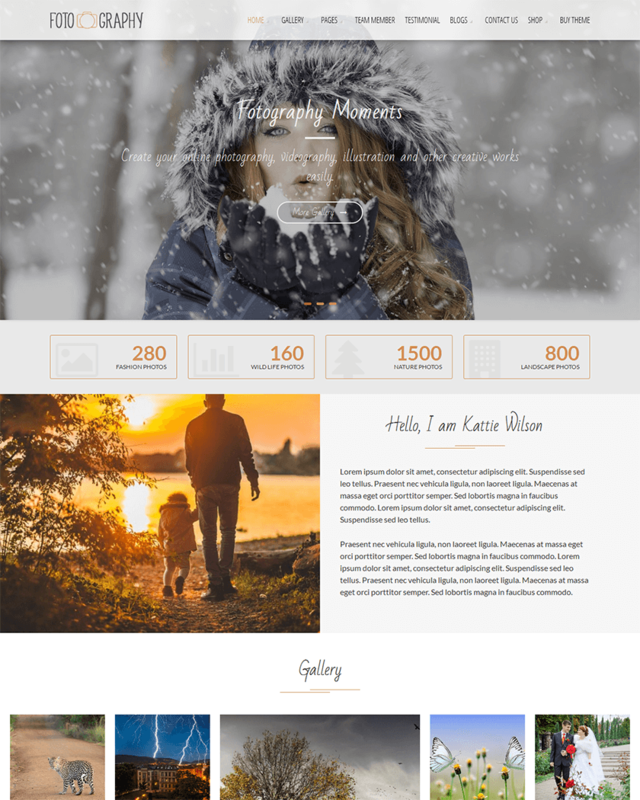 Fancy is a very professional-looking, sleek, and modern Photography WordPress theme. 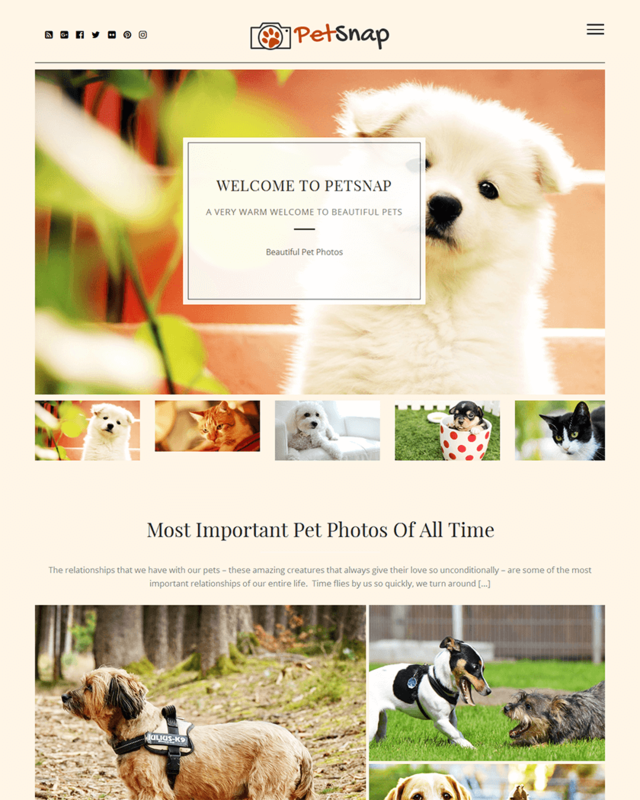 PetSnap is a quirky and fun photography WordPress Theme for photographers who have an unusual subject: animals and pets. The theme isn’t just for professional photographers. It is also for those who just love taking pictures of various animals or their very own pets. PetSnap allows the user to put photos of adorable pets in full width sliders that have smooth transitional effects, and it ensures that photos uploaded on the site maintain their high resolution. PetSnap comes in four layouts users can choose from, and it also has a gallery page template. One of its unique selling points is that it’s compatible with the Ink Lead Capture Pro Plugin. It’s similar to a newsletter where visitors who sign up get updates on camera work events, pet-related events, and other pet-related activities. It also allows the user to connect their Instagram account on the website, allowing users to share their Instagram photos on the site, too. The PhotoLab photography WordPress theme markets itself using four features: being appropriate for business purposes, perfect for sharing tips and videos, responsive, and customizable. First off, it is a good theme for business purposes because it is designed for portfolio-creation. It allows the user to establish his or her craft as a photographer through the hexagon portfolio gallery section. It is also a good site for sharing tips and videos. The blog entries will be featured in a grid-like manner with teasers so visitors can easily see what options they have. 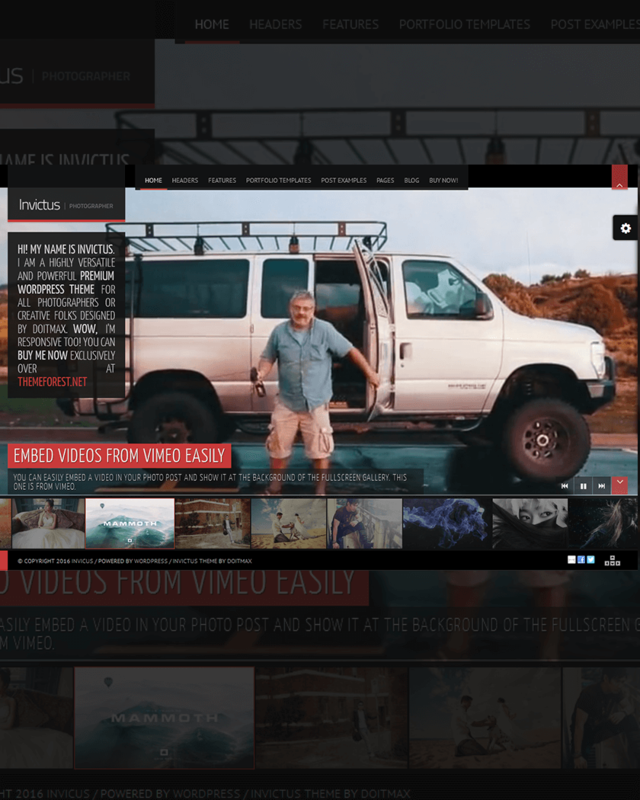 In addition, the site is video-ready, making sure that videos uploaded are of crisp quality. PhotoLab is also highly customizable. It allows the user to change the colors of the gallery, among other things, as well as the colors of each section of the website to make each section more distinct. Aside from all these good features, it is SEO-optimized, compatible with major browsers, and fully responsive in any mobile device. 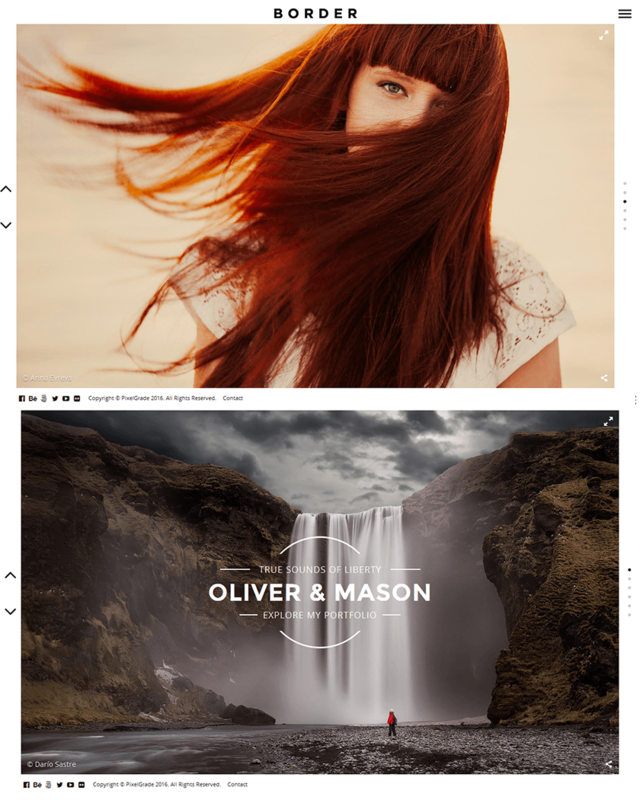 PhotoMaker is a unique photography WordPress theme designed for beautifully and professionally-taken photographs. The interface is clean but impressive, and it not only features photographs taken by the user, but also its services, making sure that visitors are informed about getting the user as a photographer. As mentioned, PhotoMaker ensures that services are also highlighted, and this can be done by allowing the user to put up several business services in the website. The site has a contact form to complete the package. Aside from the business services section as well as the gallery for portfolios, PhotoMaker allows the user to also blog, which five different formats to choose from. Its menu is also pretty different. It appears at the rightmost part of the screen, making it unique among other designs. 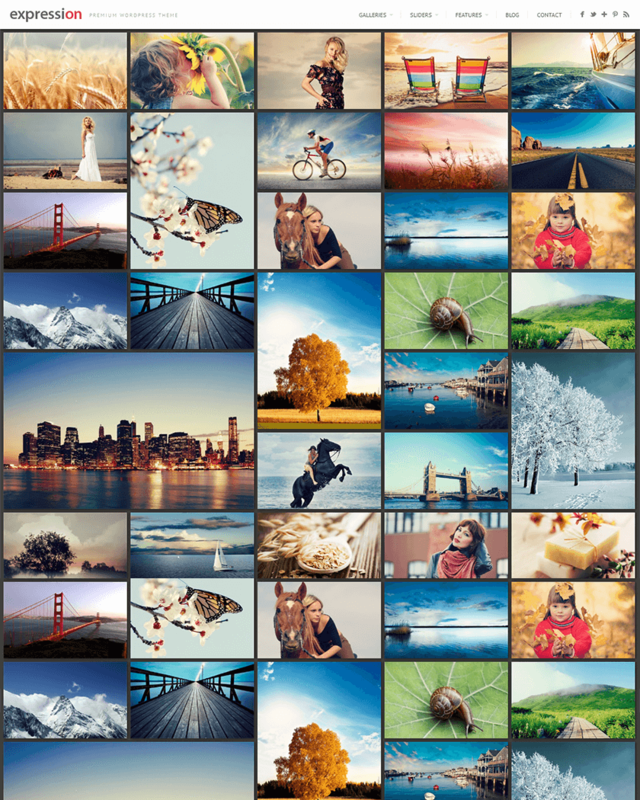 PhotoMaker is also customizable as it comes in several skins and colors, depending on the taste of the user. And the colors are not overbearing, too. It’s just the right touch without the tackiness. Clean Photo is Photography Portfolio theme for WordPress websites, it comes with an ultra modern design & focus on content, we have created plenty of layout designs, theme options & different styles for sections. It’s fully responsive & retina ready. Also it has Compatible with latest WordPress versions. We have included Premium Plugins with total value of $71, when you buy Clean Photo you will get this plugins for free! Tripod is a responsive Professional WordPress Photography Theme with drag-and-drop layout builder, the WordPress theme intended to power professional photographers blogs or sites coming with complex image gallery options.